What if I’m not sure of exactly what type of container I need? Our qualified & experienced team will assist you in deciding your best container solution. We’ll consult with you to ensure that we provide the right container for your specific needs. The more information you provide, the easier it is for us to assist you! How soon can my storage container be delivered? We can often deliver within 24 hours of ordering. Delivery time depends on our availability, the number of storage containers you need & what kind of accessories or modifications you may require. Our staff will give you a delivery date & time when you place your order. What type of modifications can be made to a shipping container? 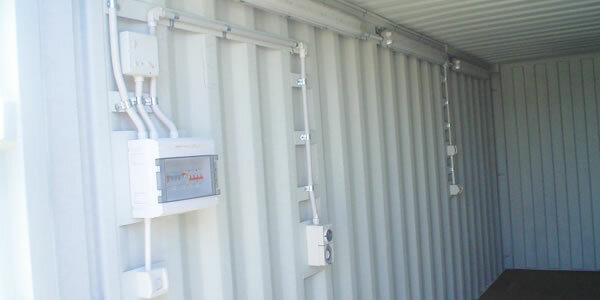 Containers can be modified by adding shelves, fitting extra doors, air conditioning, windows, etc. to adapt containers for your purposes. What if I don’t need my rented container anymore? Contact us and we will arrange prompt pick-up from your specified location. What size is a storage container? The common size of containers is approx. 6m long, 2.4m wide, and 2.6m high. 12m and new 3m containers are also available. We also have High Cube Pallet Wide (HCPW) containers that provide an extra 30cm height and 6cm width which is ideal for storing larger items. How secure are your shipping containers? If you wish to use a container as a permanent shed it will be considered to be a building and may need to be approved as a building. These are the plans you need, plus a plan of your property, for a private certifier to approve the building. Under the current system private certifiers approve buildings not the council.